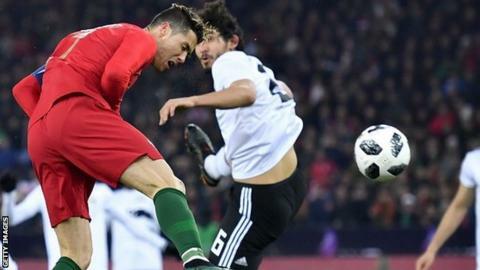 Cristiano Ronaldo won the battle between two of Europe's in-form strikers as Portugal defeated Mohamed Salah's Egypt 2-1 in Zurich. The European champions trailed until the 90th minute before Ronaldo scored twice to steal victory. Salah opened the scoring after the interval with a sweet left-footed drive from outside the area. But Ronaldo made it 43 goals in 40 appearances this term as Portugal laid down a marker before the World Cup. After a tame first half, Liverpool forward Salah backed up his impressive four-goal performance against Watford on Saturday with a smart finish to give Egypt the lead. With the clock ticking down and with victory for Egypt in sight, Portugal's captain equalised and then sealed the win with two powerful headers in the dying minutes. Next up for Portugal is the Netherlands - who fell to defeat against England on Friday evening - while Egypt face Greece. Match ends, Portugal 2, Egypt 1. Second Half ends, Portugal 2, Egypt 1. Video Review: Goal. Referee decision on field stands. Delay in match (Portugal). Video Review. Goal! Portugal 2, Egypt 1. Cristiano Ronaldo (Portugal) header from the centre of the box to the bottom right corner. Assisted by Ricardo Quaresma with a cross following a set piece situation. Ricardo Quaresma (Portugal) wins a free kick on the right wing. Foul by Marwan Mohsen (Egypt). Goal! Portugal 1, Egypt 1. Cristiano Ronaldo (Portugal) header from very close range to the bottom left corner. Assisted by Ricardo Quaresma with a cross. Corner, Portugal. Conceded by Ali Gabr. Attempt saved. Bruno Fernandes (Portugal) right footed shot from outside the box is saved in the top centre of the goal. Bruno Alves (Portugal) is shown the yellow card for a bad foul. Foul by Bruno Alves (Portugal). Marwan Mohsen (Egypt) wins a free kick in the attacking half. Substitution, Egypt. Hossam Ashour replaces Tarek Hamed. Attempt saved. Shikabala (Egypt) left footed shot from outside the box is saved in the top right corner. Amr Warda (Egypt) wins a free kick in the attacking half. Marwan Mohsen (Egypt) wins a free kick on the left wing. Attempt missed. Rolando (Portugal) header from the centre of the box misses to the right. Assisted by Raphael Guerreiro with a cross following a corner. Corner, Portugal. Conceded by Amr Warda. Substitution, Egypt. Shikabala replaces Mohamed Salah. Substitution, Portugal. Bruno Fernandes replaces Rúben Neves. Substitution, Portugal. Gonçalo Guedes replaces André Silva. Cédric Soares (Portugal) wins a free kick on the right wing. Foul by André Silva (Portugal). Mohamed Salah (Egypt) wins a free kick in the defensive half. Offside, Egypt. Mohamed El-Shenawy tries a through ball, but Marwan Mohsen is caught offside. Attempt saved. Ricardo Quaresma (Portugal) right footed shot from the right side of the box is saved in the centre of the goal. Assisted by Gelson Martins with a cross. Attempt blocked. Trézéguet (Egypt) right footed shot from outside the box is blocked. Assisted by Marwan Mohsen. Offside, Portugal. Bruno Alves tries a through ball, but Cristiano Ronaldo is caught offside. Offside, Egypt. Marwan Mohsen tries a through ball, but Mohamed Salah is caught offside. Substitution, Portugal. Gelson Martins replaces Bernardo Silva. Substitution, Egypt. Amr Warda replaces Abdallah El Said. Delay in match Mohamed El-Shenawy (Egypt) because of an injury. Attempt missed. Raphael Guerreiro (Portugal) left footed shot from outside the box is close, but misses to the left following a corner.